How Many Questions Are on the Permit Test? Indeed, how many questions are there? 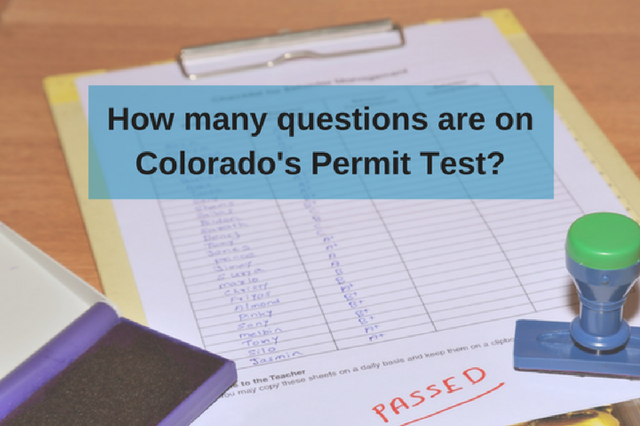 Although Colorado allows permit test applicants to retake the exam multiple times without penalty, we advise you to take a step back and reflect on what went wrong before you give it another shot. Did nervousness get the better of you? Did you adopt the dangerous “I already know these things” mindset and went to the exam venue thinking you would pass with flying colors without studying? The driver’s permit test, which is one of two major tests every Colorado teenage driver must pass to obtain a driver’s license (the second is the actual road test), is a written exam that measures any prospective driver’s knowledge of safe driving rules and Colorado’s driving laws. While it is “written,” with the installation of the Colorado Automated Testing System, the test is taken electronically. Note that aside from the written test, you should also pass the vision test to get your provisional driver’s license. What type of questions should you expect? What can you do to pass the exam? Study the Colorado driver’s manual. You can download the Colorado Driver’s Handbook here. It tells you everything you need to know about driving in the state of Colorado. Download online practice tests. Practice questions can be found on various online sites, such as Driving-Tests.org. Google “Colorado driver’s permit practice test” to start your search. Both free and paid options are available. Enroll in a driver’s ed course from a DMV-recognized driving institution. Western Slope Driving Institute’s Parker driver’s ed course is a state-approved training course for prospective drivers, and even long-time drivers who want to brush up on their knowledge of Colorado’s driving laws. Relax. Jitters and nervousness can cause your mind to go blank and forget everything you have learned. Get enough sleep. You do not want to fail the exam because you are too tired to focus. The road to obtaining a driver’s license can be nerve-wracking, but with knowledge comes confidence. Remember: When it comes to the Colorado driver’s permit test, preparation plus adoption of the right mindset can do you no wrong.